A dead cow’s head streaming with blood, flies swarming around it; a photograph of a corpse’s head propped up on a table – a cheeky teenager posing next to him, surgical knives laid out clinically, dead butterflies, cigarette stubs. Up close, Damien Hirst’s famous installations and sculptures showing in his retrospective at Tate Modern are every bit as challenging and stomach-churning as you might expect. It isn’t always pretty or nice; it isn’t for the faint-hearted. 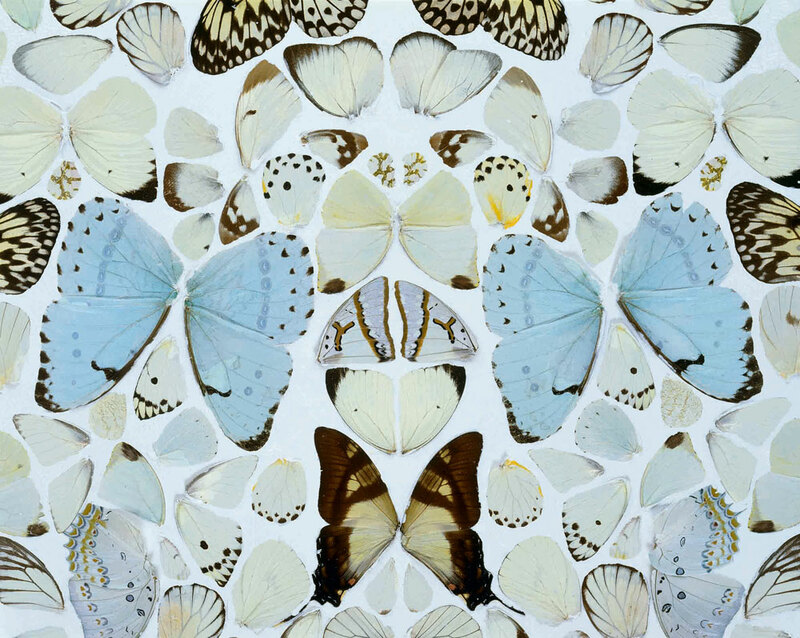 Throughout the exhibition, Hirst’s sheer boldness simultaneously captivates and repels. Huge cabinets, backed with mirrored glass, display hundreds of medicine pills, each one perfectly placed like precious stones in a jewellery shop. In Lullaby, the Seasons, these are arranged in colours reflecting each of the seasons. Life, however, is swarming, in a humid room sealed with plastic doorways; butterflies fly freely, feeding on sugar water and flowers. Remnants of the dried out pupae from which they hatched stick to huge white canvases. It’s a moment of beauty and affirmation albeit in a sanitised, unnatural environment. Surely Jane Campion was inspired by this work for her stunning butterfly scene in Bright Star; a deeply romantic film about the life of John Keats. Standing in between two halves of calf, cleanly cut down the middle and preserved in formaldehyde, I am given access to its intricate, inner workings of bones and muscles. In spite of the absence of blood, the nausea swells. Beautiful and disturbing; I want to look and I want to look away. This is like much of Hirst’s work; we are confronted with the reality of life and the inevitability of death through his particular artistic lens on the everyday. Crematorium is an over-sized ash tray; a mass of stubbed out cigarettes infuses the white gallery space with the smell of smoke. A lifetime’s fix of nicotine piled up like the ashes of a cremated body. As he grows older, the questions seem to get bigger. In Doorways to the Kingdom of Heaven dead butterflies, their delicate wings intricately arranged, form stunning images of stained glass windows. In I Am Become Death, Shatterer of Worlds, imagery from Hindu and Buddhist traditions is drawn on. An angel carved from white marble is pulled open to reveal the humanity of bodily organs, fusing the heavenly with the earthly in The Anatomy of an Angel. Yet transformation and resurrection dissipate in the next room with Black Sun; an apocalyptic circle of thousands of dead black flies crushed together. The bloody cow’s head comes back to haunt me. In the latter stages of the exhibition, Hirst’s materials become more opulent. He may well feel that he, in his own words is “King Midas” with everything he touches turning to gold as the pills turn to pound signs. Cynicism aside; here in the penultimate room, the works take on a metaphysical, almost spiritual dimension. As Hirst becomes gold, so do I; my body which was earlier drowning in drugs and cigarettes, is now full of diamonds – again laid out precisely in glass cabinets lined with gold mirrors. I sparkle from head to toe. I have fought my way through the blood and ash; the flies and animals sliced in half – from death comes something beautiful and glorious. Have I found heaven? The final image in the exhibition is a dove caught in mid flight; at once static and energetic; a symbol of peace; yet captured and manipulated by Hirst in death. The thrill of flying and life; the horror of what lies behind, spurs me out of this created space and back to my own observations of the outside world; my own vision of what it is to die and live. You might not think it’s art; you might struggle to find its aesthetic qualities but Hirst is not an artist to be ignored or mocked. These works are a statement of the times as well as a stamp on what the future holds. Don’t take your granny (unless she’s a retired butcher) but do take your children who will love his bright colours, his biological dissection of animals and live butterflies fluttering above their heads. Enduring, disturbing and fascinating. There’s just a couple of weeks left to catch the exhibition, running at Tate Modern until 9 September. Katherine, affectionally known as KMC to her nearest and dearest, is a maker of all sorts – story writer, poet, theatre producer, baker, bunting cutter, aspiring novelist. Thinking about transformation, justice, creativity and culture keep her mind buzzing when it should be sleeping. She lives as part of an intentional community on an estate in Kings Cross and you can follow her every move on that social network which everyone seems to like. She is currently the editor of Tearfund Rhythms (rhythms.org). // So why am I pushed into academic subjects rather than the arts?